Every year, broadcast spends millions upon millions turning scripts into pilots and pilots into series. And frequently, it picks scripts with quite a few commonalities. Of course, if you have an entire professional class assigned the task of figuring out what's popular and making it into a TV show, this is going to happen. But it's worth parsing some of the duplications in order to see what network heads think will work and sometimes what they're all thinking at once, for reasons known only to them. I know, right? This seems so incredibly specific that you'd think it couldn't possibly come up twice in the four-and-a-half-network range of broadcast TV. 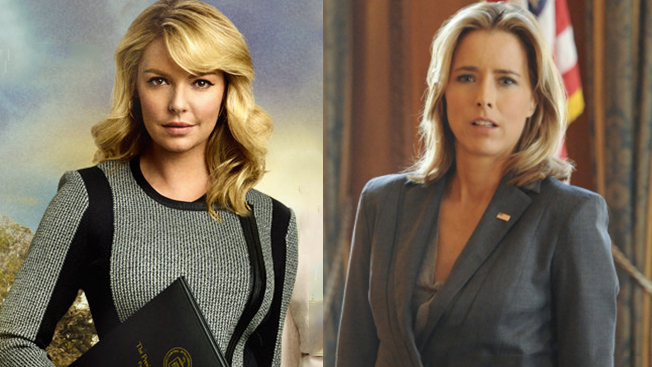 But Wednesdays starting in November and Sundays starting this week, check out Téa Leoni and Katherine Heigl as the secretary of state and a CIA underboss, respectively, discussing Very Serious Political Things and making quasi-topical observations about Syria. The driving idea seems to have been that Scandal proved the need for political shows featuring women in the main roles, not that if you put a good drama on, folks will flock to it. We'll see. This was a depressingly popular one. Manhattan Love Story has a now-married supporting character who (maybe) used to get drunk with her friend and make out; Gotham features two female characters who share a secret relationship that one character's husband knows nothing about; and the How to Get Away With Murder pilot includes the suggestion of an intimate relationship between a lawyer and a married client. I mean, that's a lot, and these are all in the first episodes! Broadcast shows about gay male characters have been on a steady upswing (Will & Grace, Modern Family, etc. ), but portrayals of gay women have a longer way to go, I guess. Granted, two middle-aged women having a complicated romantic relationship in the background of their professional relationship is a much more interesting idea narratively than "hot girls making out zOMG," but they all feel a little salacious. We'll see how they turn out. Meantime, go watch "Cousin Liz." With A to Z, Marry Me, Manhattan Love Story and Selfie, it is the season of producers who saw Silver Linings Playbook. Mind you, many of these are good: Marry Me is great, Manhattan Love Story is solid, and Selfie is a big mess but at least it's an ambitious mess. But they're all trying to grab the exact same demo, and they're mostly airing back-to-back on Tuesdays (starting at 8 p.m., ABC has Selfie, then MLS, then you can switch over to NBC for Marry Me and About a Boy—another meet-cute extravaganza). As is so often the case, this is on some level a response to audience demand, but it is also a very serious test of the capacity that demand indicates. Two of these might survive. Four? Probably not. This is actually a trend of which I am heartily in favor, but it's still a glut: DC Comics characters getting their own TV shows. The Flash is due for a good run (it felt appropriate to make this joke twice) on The CW; pretty much all the Gotham City heroes and villains except Batman are in Gotham; and, in the strangest possible turn of events, horror comic lead character John Constantine has his own show on NBC (it's super fun!). In our article about DC Entertainment this week, chief creative officer Geoff Johns made it clear that they'll be trying to spawn new series, as well as keep old ones running: The Atom is due to appear on The CW's Arrow later this season. Strategically, this is really interesting on DC's part, but I fear for the shows that don't have the interconnectivity of DC parent company Turner (and OK, the low ratings success threshold at The CW) behind them. NBC buried Constantine late on Fridays, and Fox's Gotham got some harsh reviews (though it did open to an impressive 3.2 demo rating). Lotta dead kids on our airwaves this year—it will be very surprising if at least one person on hospital ward drama Red Band Society doesn't die by the end of the season, and the entire focus of Gracepoint is on a child's murder and the kids who may or may not know about it. Gotham, meanwhile, features kids in every kind of danger, particularly young Bruce Wayne, who sees his parents gunned down in front of him but doesn't get the benefit of the requisite fast-forward to troubled adulthood all the movies have employed. Selina Kyle's childhood, too, seems to be fraught with peril. And yes, every one of these is a Fox show. The network is doing its darndest to age down this year, and adventures with kids seem to be the order of the day. (Not Gracepoint. That's just sad and wrenching.) But if you're trying to age down and you're relying on crime shows and doctor dramas, you'll end up backed into some interesting corners. There are other twofers (and more) throughout the slate. Some of them are actually good (who'd have imagined a season in which we'd have two new comedies about the difficult lives of young Hispanic women? We prefer Jane the Virgin to Cristela, though) and others are depressing but to be expected (seriously, eight new cop shows). Check out our extensive writeups of new series on ABC, NBC, CBS, Fox and The CW for advice on which ones are actually good.